Executive Chef Frank Pabst is known for his innovative and brilliantly executed West Coast plates, insisting on using seafood from wild and sustainable harvest. Enhanced by the intuitive service from Stephan Cachard’s dedicated team, the dynamic dining room provides action views of the opposing ‘East meets West’ kitchen and raw bar. The sweeping main bar leads out to the heated patio and the private wine room holds the extensive award-winning wine and bubble selection. 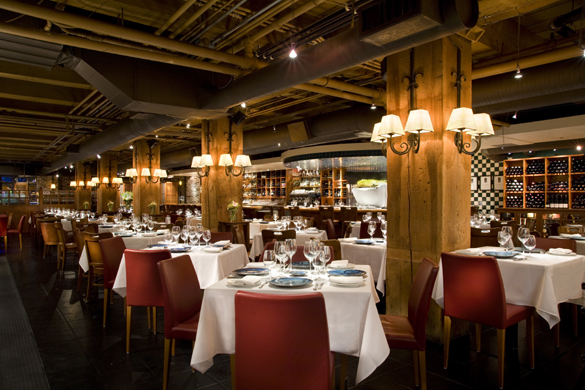 Housed in a handsome brick and beam heritage warehouse conversion, Blue Water Cafe is in the heart of historic Yaletown, the city’s vibrant and hip neighborhood. One of Canada’s leading culinary talents, chef Frank Pabst has made enormous contributions to Vancouver’s culinary landscape. Tenures in Michelin-starred restaurants in Germany and the south of France led Pabst to Blue Water Cafe, Canada’s quintessential seafood restaurant. In the Blue Water Cafe: Seafood cookbook, Frank’s signature brand of ‘Unsung Heroes’ sings of the sea and is an ode to formerly under-recognized coastal species. Wine pairings from Andrea Vescovi and Chris van Nus, both Vancouver Playhouse International Wine Festival Sommeliers of the Year.